Next in the series on Jeff's Famous Jerky is this Black Pepper & Sea Salt variety. It's owned by the company of the same name, based out of Big Bear City, CA. 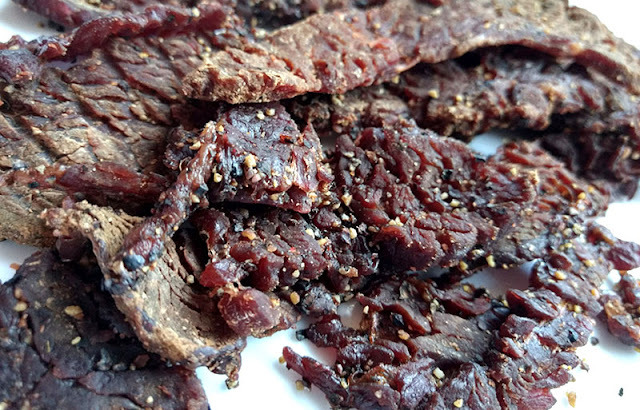 Jeff Richards has been making beef jerky since the 1970s perfecting his recipe year after year. His love for cooking took him into the restaurant business for over 20 years. He currently runs a consulting company called Creative Business Adventures where he helps entrepreneurs achieve success. In 2006 he started working on creating his own beef jerky brand, and just this year saw the launch of his new business. Jeff claims he uses a higher grade of beef than the round steak used by most other brands. Beef, soy sauce, worcestershire sauce, brown sugar, chili sauce, natural smoke flavoring, sea salt, spice, pepper, vinegar. The first thing I taste from the surface of these pieces is a worcestershire sauce flavor, followed quickly by a light sweetness. Soon after, I can get a different kind of sauce flavor, not really soy sauce, not really chili sauce, though it could be a comglomeration of everything. The chewing flavor starts with some natural meat flavors, while the black pepper starts to make a light showing. For being labeled as "Black Pepper & Sea Salt", the black pepper does build up to a well-noticed showing after eating a couple of strips. It's really more as an aftertaste than directly from each piece. As for the sea salt, I never could tell the difference between that and table salt. I don't see any salt granules on this like I've seen on other brands that made salt as a labeled flavor. But, there is indeed a saltiness to this, as would be expected in just about any jerky. I'd rank that saltiness as having a moderate intensity. The flavor that seems to dominate this jerky over everything else is that "sauce" flavor I noted above. It actually starts out as a clearly defined worcestershire flavor, but quickly transforms into a different flavor, perhaps a combination of the worcestershire, soy sauce, chili sauce and sugar. The sweet is also dominant and noticeable all throughout the chewing. There's also a tanginess in the chewing, much like what I reported in Jeff's Original variety, that seems to add a lot of taste interest. In addition to the black pepper seasoning, there are other spices that build up an aftertaste, perhaps a touch of heat in the back of my mouth. I still see this jerky as mild, at least on a heat perspective, but definitely spicy. If you don't tolerate hot & spicy foods, you might see this as somewhat hot. The natural meat flavors do come through in this at a lighter amount, perhaps due to all the other flavorings competing for attention. I can also pick up a light fatty flavor too. Overall, what you're going to notice the most is an initial worcestershire sauce flavor that mixes into a different kind of saucy flavor, perhaps a mixture with soy sauce, chili sauce, and sugar. You'll definitely find a fair amount of sweet, while the black pepper shows up mostly as an aftertaste that builds up over a couple of strips. The sea salt is largely the usual saltiness you find in most jerky brands, and then there's some tanginess and some light natural meat flavors. These are slices of whole meat, sliced into strips of varying from 3 to 8 inches long, and sliced to a medium thickness. 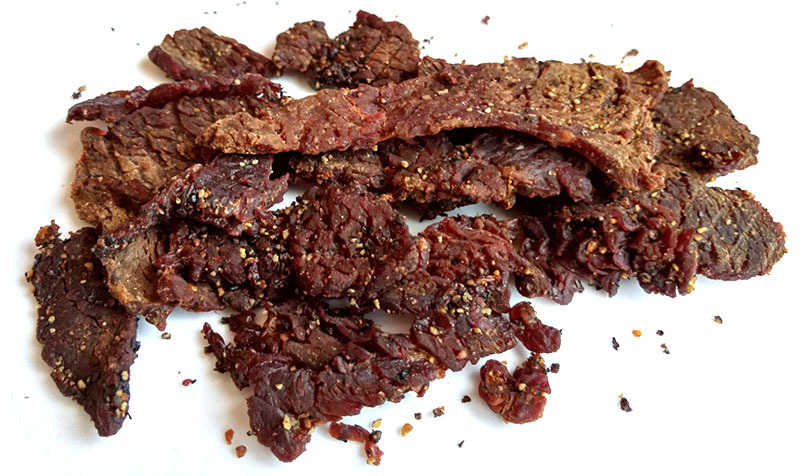 This is a semi-moist jerky, with a dry but semi-sticky surface feel. These strips are very soft, and very flexible. It's easy to bite chunks off from these strips, and chewing seems moderately easy. The chewing texture starts off feeling soft and tender with just a little bit of initial chewing resistance. It seems to only take about 10 seconds before it's rendered into a soft mass. At that point, it has a steak-like feel, but a little more soft. Most of these strips have noticeable streaks of fat, mostly as marbilized fat. I don't see any tendon or gristle. I also get some stringiness, but not as much as I reported in Jeff's Original variety. I also find some unchewable wads of tissue. Even though there's a semi-sticky surface feel, my fingertips don't seem to pick up any residue aside from black pepper bits. And I do get a lot of black pepper bits falling on to my lap as well. 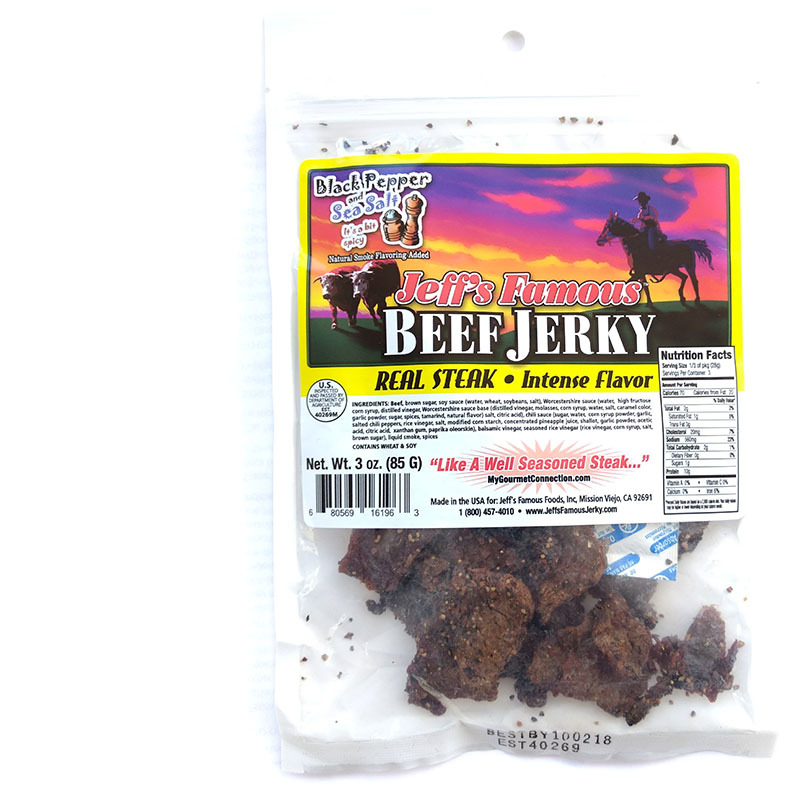 Jeff's Famous Jerky sells this Black Pepper & Sea Salt variety from it's website at a price of $20.95 for a 3 pack, with each package at 3oz. Add to that shipping of $6.50, and it works out to a price of $3.05 per ounce. For general jerky snacking purposes, at the $3.05 per ounce price, it's a decent value. I actually get a lot of snackability for an excellent overall flavor, good meat consistency and decent chewing texture. That price is a lot higher than what you pay for major brands of jerky in grocery stores, but it's a very good tasting jerky, quite a bit more snackable than those major brands. As a "Black Pepper & Sea Salt" beef jerky, at the same $3.05 per ounce price, it's a weak value if that's all you're buying it for. I actually do get a good deal of black pepper flavor, and the usual saltiness that I find in most jerky brands, but I'm not seeing that black pepper as being so much better to warrant the significantly higher price. Rather, you'd buy this jerky for the other flavorings and meat consistency. This Black Pepper and Sea Salt variety from Jeff's Famous Jerky offers a fair amount of black pepper flavor and the usual moderate saltiness you find in most jerky brands. But it's really the marinade and flavorings that makes this jerky so enjoyable. It actually seems quite comparable to Jeff's Original variety, but with a different marinade, and the addition of black pepper. It has a nice sweet, saucy flavor with some tanginess and spiciness in the chewing. It actually starts out with a defined worcestershire flavor but quickly transforms into more of a mixture of worcestershire, soy sauce, chili sauce and sugar. The spiciness is not so much heat, but just a bold set of seasonings that might build up some heat if you're not used to spicy foods. Add to that a light natural meat flavor with a touch of fatty flavor, along with a semi-moist, steak-like chewing, and it seems to create a lot of snackability for me. My recommended beer pairing for this, go with a lighter colored ale just to help quench the spiciness, and not compete too much against this jerky's flavors. Try a Fat Tire Amber Ale or the Orange Blossom from Big Bear Mountain Brewing. The package that I got was surprisingly sticky; a friend described it as "gooey". The taste was decent though.